In 65 lines of code, I have created a simple JSFX plugin for REAPER that will hopefully be very useful for anyone interested in pro guitar/bass authoring. This converts your chart in real time into musical notes that can be played back with any synthesizer plugin or MIDI keyboard. Why? Because unlike all the other instruments, there hasn't been a way to "preview" pro guitar charts in REAPER. That makes authoring very difficult to check for accuracy, especially if you have no tab or sheet music for reference. Now with this plugin, you will immediately know what your chart will sound like on a real guitar or bass, saving you tons of time. 3. 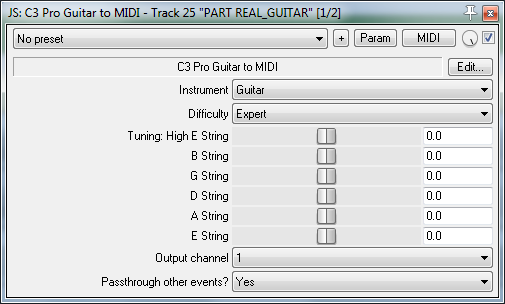 Open ProGuitar2MIDI.zip and drag the folders "Effects" and "FXChains" onto the window that just opened. Windows should merge the folders together. 5. Choose "C3 Pro Guitar Preview.RfxChain"
Repeat for the PRO REAL_BASS track. I recommend saving your project as a template now! You won't have to repeat this process every time if you do so. Whenever you start a project and plan on charting pro guitar load this template. I saved it over the original C3 template. You can now start charting and instantly hear the results. To edit the settings (difficulty, tuning, etc) just open the FX window and click on the "JS: C3/progtr" effect. You can also edit the ReaSynth settings by clicking on the "VSTi: ReaSynth (Cockos)" effect. Want to use a MIDI device instead? 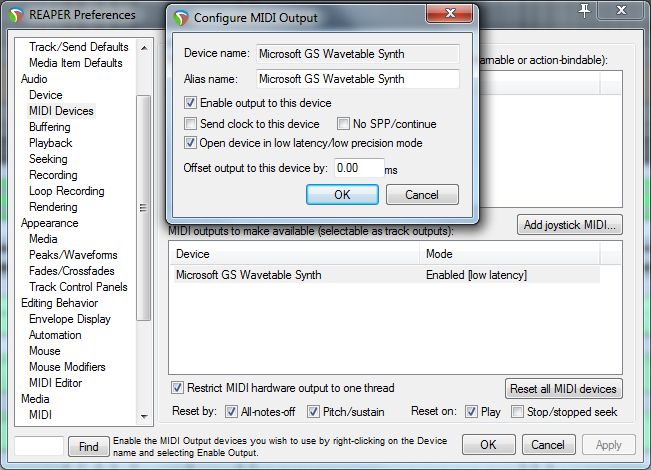 Make sure your device is enabled for MIDI output in the REAPER preferences. 3. Double-click the device you want to output to. If it doesn't appear in the list, try checking your connection and then click on "Reset all MIDI devices"
So far it just plays back all notes as regular notes. Arpeggio ghost notes are ignored. I eventually want to add support for Guitar Pro-style effects on notes depending on their channel, such as bends, muted notes, and harmonics. Instrument: Set to Guitar for PART REAL_GUITAR, Bass for PART REAL_BASS. Bass is transposed down an octave from Guitar. Tuning: Drag the sliders for each string left or right to change the tuning for that string. The range is -3 to 3 semitones, but should you need a bigger range you can type in the value in the box to the right. With all sliders at zero the overall tuning is Standard (EADGBE). Output channel: Which channel to play the notes on. This doesn't really matter if you're using ReaSynth, but if you're outputting to a MIDI device and you want separate patches for guitar and bass they need to be on separate channels. Passthrough other events? : Whether or not to pass through non-note events. I would leave this on Yes. Enjoy! Please feel free to post any bugs or suggestions. Wow, this is grand! I'll be sure to let you know my experiences after the coming weekend. This looks great! However, the charting program I use (Ziggy Pro Editor) already has MIDI playback. Thanks for making this though, looks good. Ooh, nice. Thanks for that! Thanks! The goal was to have that feature in REAPER so there would be no need to download an additional program, and people can continue authoring in the same way as the other instruments. This has been really helpful, thanks a lot for this program! Like TheWay mentioned, Ziggy Pro Editor also has the feature, but this is really helpful as I no longer have to load up the chart in another program to be able to listen to it. Being able to do it all in Reaper makes pro guitar authoring a lot smoother for sure. I can't say I entirely understand anything about Pro Guitar charting, but regarding the Track Template, would that be better served as an FX Chain? That way you can just right click and add the effects needed per track instead of having to erase the sample track it makes? good idea! somehow I didn't think of that. I'll upload that shortly. I quite like the plugin. Very helpful so far. Any chance for supporting capo's? Thank you! I am starting to work on a new update, I will consider adding capo support which shouldn't be too hard. For now, you can set the tuning of each string to the capo position (if you need higher than the 3rd fret you can type them in the text boxes). If I'm correct that's what you would have to do in Magma anyways. Correct, but that would throw any non-open notes off by the same amount. Rock Band interprets the midi notes as absolute fret numbers, so this is not a perfect solution. I could automate this, but that would be a lot of unnecessary work. So you're saying you want all fretted notes to sound like the absolute notes, but open notes to sound as if there was a capo? For example say a C chord is x32010, if you have a capo on the 3rd fret and you play an Eb chord (with the C shape) it would be charted as x65040? That's how capo's work, no? They don't affect notes fretted higher than the capo. And yes, that's how I plan to ultimately author a large portion of the Pro Guitar chart. Is this not how I should do it? I did find something here. Seems also clear from that thread that HMX authored absolute fret numbers with tunings different from standard. Edit: or maybe not. Seems to be standard to tab relative to capo, which doesn't make any sense to me. This tab is exactly the same as HMX' chart, and has a capo on the first fret. I'm not worried about chord names. Very few chords are played on the guitar with the capo and they don't look like any fingerings I could find. Chord names can be overridden anyway. What exactly did you mean by the following? Keep in mind that you wouldn't be able to play the song in-game with an actual capo. Perhaps I should also provide a transcribed chart without capo and nashville tuning. You can't place a capo on the frets of the pro guitar, the game will think you're holding a barre and thus open notes won't work at all. That must have been why HMX charted it that way. It makes sense for tabs to do that as well, so that if you play the song on a real guitar and you don't have a capo, it would still sound accurate, it'd just be in a lower key. The song in your link "The Con" is entirely made up of chords. I think showing the right chord names is important especially if you're learning guitar and getting into music theory. The one thing I don't like about HMX's chart is that since it's charted relative to the capo, the chord names are all in the wrong key... I think that's where changing the tuning would be an easy fix. The "nut" is then where your capo would be.